You’re getting 37mbps down on a 24mbps line, how is that possible? Im happy for you man, we’re stuck in the city centre in glasgow here and the council will not let virgin media dig up the roads to install fibre optic.. I might as well go back to my 56k modem, BT are so slow! Are you available for development work? I’m looking for some quotes for modifications to our install of interspire shopping cart, it’s PHP. That’s because it’s not a 24Mbps line, it’s a 40Mbps line, delivered through Fibre to the Cabinet (FTTC) technology, the same technology as is used by “BT Infinity” if you’ve heard of that. Yes, I’m in agreement with you, speeds in many cities are appalling and the roll out of improved technologies such as FTTC is not progressing anywhere near fast enough. I’m afraid I’m not available for development work. What with my day job and my open source projects I’m pretty much fully booked. I am in Chicago and pay 70 USD a month for the below speeds..Your speeds are impressive. I had never heard off pingtest.net and gave it a try and was schocked to see I got an F.
I then fired off the below question to Experts Exchange. They indicated not to worry about it…Do you agree ? Also if you ever do become available for some php work..very small job..please email me. I like your site and work. I can see why you are in hi demand. 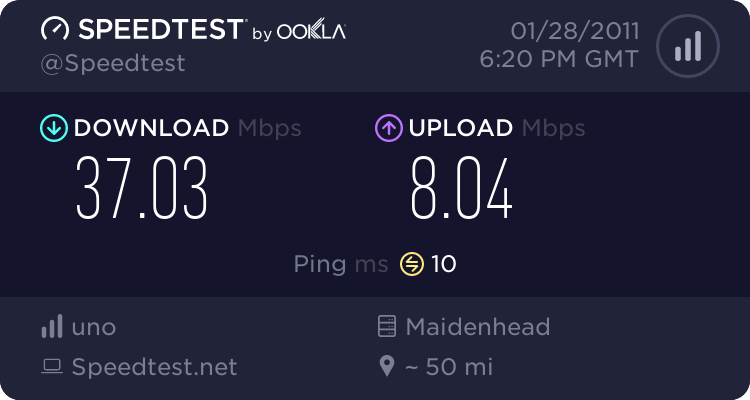 When I go to speedtest.net my download is 20 and my upload is 3.81 which is what Comast promises me, so no issues here. However, when I go to pingtest.net I get an F grade with 86% packet loss, Ping 36 ms, and Jitter at 3ms. Why is indicating such a poor ping..my speed seems pretty good…Note I turned off my firewall, antivirus, and tried the ping from different servers. Please advise. As long as one ping packet gets through, it’s doin its job, which is to see if the remote node is reachable. As a performance metric, ping packets are … hmmm … not my first choice. If the bandwidth is as promised, and connections are reliable, then I personally don’t care about incoming pings, and indeed my firewall is set to drop them. When testing a straight ping time, one or so packets should be enough. pingtest.net tests more than this however so that’s why the EE responder is not completely correct. In addition to measuring the ping time from your machine to the test host the test site sends multiple pings to this same host and calculates the weighted average difference between the different results. This gives you “jitter”, a measure of how much your ping time varies over multiple attempts. A good connection will be largely consistent between ping attempts so your jitter will not vary by more than a milliseconds. Your jitter seems reasonable. The third and final component of the test is probably the most important. The above two metrics can only be calculated for the packets that actually arrive. Packet loss is a measure of the probability that a request sent from your machine will actually arrive. This is done by sending 250 ping packets from your machine to the test host. The test host receives and counts these and then sends the results data back to your browser. This tells you essentially what the probability is that a request sent from your machine (say to load a website) will actually arrive rather than failing and having to be resent. The more resends are required, the slower your traffic will travel. In your case, the tests show that when a request does arrive it travels quickly, however in a large percentage of cases requests sent do not arrive at all. Given that data arriving is more important rather than how quickly it gets there (quality over quantity) this results in the test giving you such a low score – 86% of requests failing is very poor. Normally I wouldn’t speculate as to why this might happen but it must be said that the most common is a weak wireless connection. To rule this out, connect directly to your router with a cable and run the test again. In 90% of cases the packet loss will then tend toward zero. Uh-oh…The above results were done directly connected to my router….I do have a splitter (one cable goes upstairs to my router and the other to my tv) …down in my basement where the cable comes in…I will connect the router diretly to the incoming cable from the house without the splitter and see if that works.. If the ping results do not improve any suggestions ? Ok, so I switched out my Motorola SBG6580 cable/modem for a Linksys Cable Modem and a Linksys E2000 router and now my ping test is PERFECT. Why is that ? Note on my Motorola Cable Modem/Router I did have ports open for IP camersas (Port 80, 81811, and 82828). Per the Linksys IP camera I need to have port 80 open/associated with the IP address of the camera. Any commection ? I’m afraid I can’t suggest why one modem is better than the other but I’m glad that it works better. If you open up the same ports for the cameras in the new modem, do you keep the good results? still good results after installing the camera…thanks again for calendar and your website..